Some cool sounds are just around the corner to keep Aurorans warm this winter. Preparations are now underway for a full month of blues, leading up to the annual Aurora Winter Blues Festival, which will culminate Friday, March 15 and Saturday, March 16 with two full nights of performances at Theatre Aurora. Headlining this year’s festival is an all-Ontario slate of talent, with JW-Jones and the Jerome Godboo Band taking the stage on March 15, followed the next evening by Soulstack and the Johnny Max Band. JW-Jones is a Canadian Billboard Top 100 Blues Artist and Juno-nominated artist celebrated for his high-energy shows. Toronto-based singer and harmonica player Jerome Godboo is a returning favourite to the festival who has leant his talents to albums by everyone from Ronnie Hawkins to Jeff Healy. Saturday headliner Soulstack is billed as “delivering a visceral experience; one of the seasoned musicians playing the music of their roots with authentic realism.” They will be followed by Johnny Max, “a soulful singer and brilliant entertainer who has audiences thoroughly enjoying each show” with his blend of Stax/Volt, Atlantic, Funk and Blues. Helping to facilitate this atmosphere of dancing is a venue change back to Theatre Aurora after a two-year stint at St. Andrew’s College. Theatre Aurora is a smaller venue, say organizers, but its Henderson Drive location lends itself more to a party atmosphere. In previous years, proceeds from the Aurora Winter Blues Festival have been split between CHATS (Community & Home Assistance to Seniors) and Blue Door Shelters. This year, however, the Music Aurora Board has gone a different route, focusing the philanthropic part of the Aurora Winter Blues Festival on Music Aurora’s Youth in Music program, which aims to give aspiring young musicians the chance to get their hands on musical instruments, afford lessons, and even have the chance to land paid gigs, something that is particularly challenging to teens and older youth looking to just get a foot in the door. “CHATS and Blue Doors have been wonderful partners over the past couple of years, but we decided for this year going forward right now, we’re going to look at funding for our Youth in Music program, giving youth opportunities to showcase their talents,” says Mr. Smith. The community will see these opportunities in action as early as Sunday, February 10 at 33 1/3 Records at Bayview and Hollidge, which will host the first of a series of pop-up performances across the community throughout February and March, each featuring local youth musicians. These pop-up performances will have an added poignancy following the death of John Abel last month. 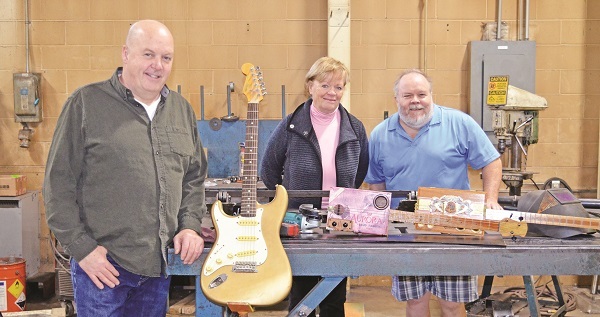 The former Deputy Mayor of Aurora was an active member of Music Aurora and instrumental in both the growth of the Aurora Winter Blues Festival as a destination, and in making these pop-up performances happen. In addition to these pop-up performances, a further warm-up act to the main event will be the annual Blues Bash kick-off which will take place on the evening of Saturday, March 2, featuring the Bywater Blues Band. For more information on the Aurora Winter Blues Festival, a schedule of pop-up performances with featured artists, and how to get your ticket for the 2019 Blues Bash, visit musicaurora.ca/blues-festival.